Front Flap: "Eve Wilson's face was once scarred by a vicious assault. Terrified and ashamed, she escaped to the online realm, where she could choose the face she allowed people to see. Years later, her outer scars faded and inner scars buried, Eve has fought her way back to the real world and is determined to help others do the same. Now a graduate student moonlighting as a bartender, Eve researches the addictive powers of online communities. When her test subjects begin turning up dead as a result of apparent suicides, she doesn't know where to turn. Homicide detective Noah Webster is one of the few people who believe the victims are connected murders. Eve becomes Noah's online guide and realizes that the handsome detective may have secret scars as painful as her own. As Eve and Noah chase a killer who is always one step ahead of them, together they try to overcome the tragedies of their pasts and learn to trust again, but they soon discover that danger is much closer than they think." Excellent, excellent, excellent. Karen Rose is one of my favorite authors and I have to say that once again she has hit the ball out of the ballpark with this one. Once I started reading "I Can See You" I couldn't put it down. The story is very well done and just when I thought I had figured out who the killer was, the story sent me in another direction. Someone is constantly watching Eve and following Noah and his partner. Then there are watchers watching the watchers and you really don't know who to trust. Convoluted enough for you. The killer's viewpoint is chilling, creepy and he uses his victims worst fears against them. He's a truly diabolical character. Eve and Noah are truly dynamic characters, very complex and 3 dimensional and will have you routing for them throughout the story, hoping they will trust not only themselves, but each other enough to get together. 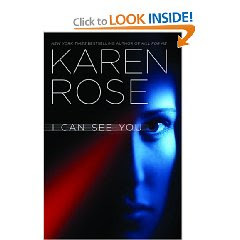 "I Can See You" is truly a romantic suspense thriller which I highly recommend. Thank you to Miriam from Hachette books for providing me with a review copy. And guess what! The book is available as of TODAY! So run out and get your copy or order it from Amazon. Just don't start reading it before you go to bed. "Karen Rose builds the tension steadily so that as you get anxious, you can't bear to put the book down. I found that the computer and internet angle helped the book. The action/thriller side helped the romance while the romance helped build the tension. This is my first Karen Rose novel, and I'm off to look for her earlier books!" "What do you say about a book that has everything you want in a romantic suspense? First, it keeps you entertained from beginning to end. The pace of the book keeps you turning the pages and trying to figure out who the killer is to the last chapter." "This novel is complex, with many fascinating twists and turns, and I couldn’t put it down."